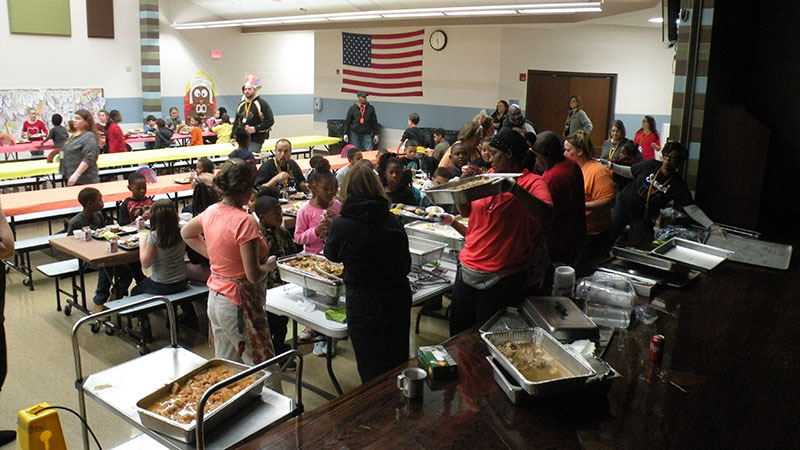 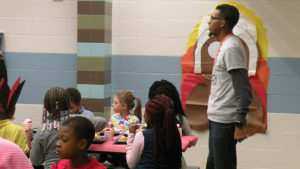 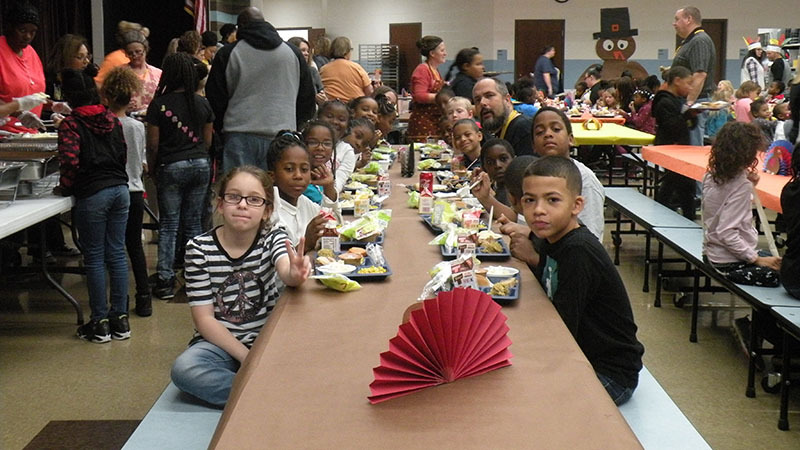 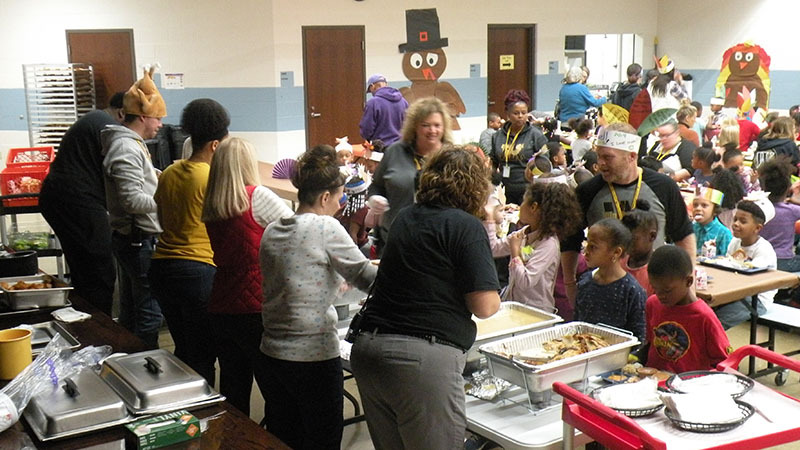 Jefferson staff and students celebrated Thanksgiving with their annual lunch. 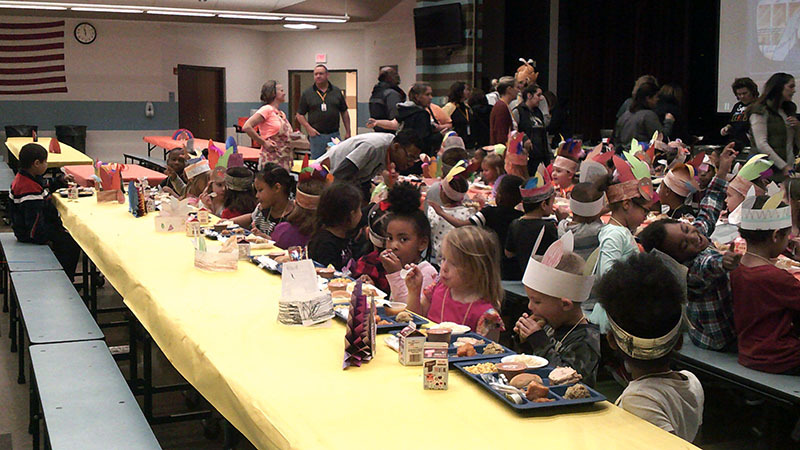 Staff and students ate a full Thanksgiving meal prepared by our amazing cafeteria staff. Thank you to the many volunteers that came to help out and to the people that donated turkeys for the meal. 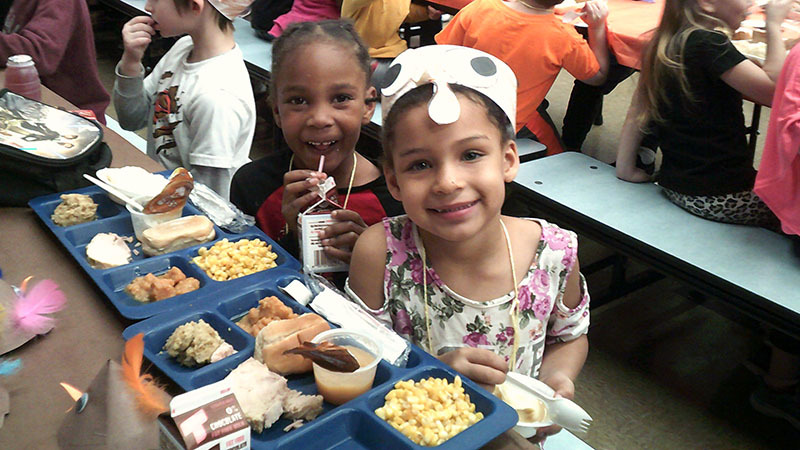 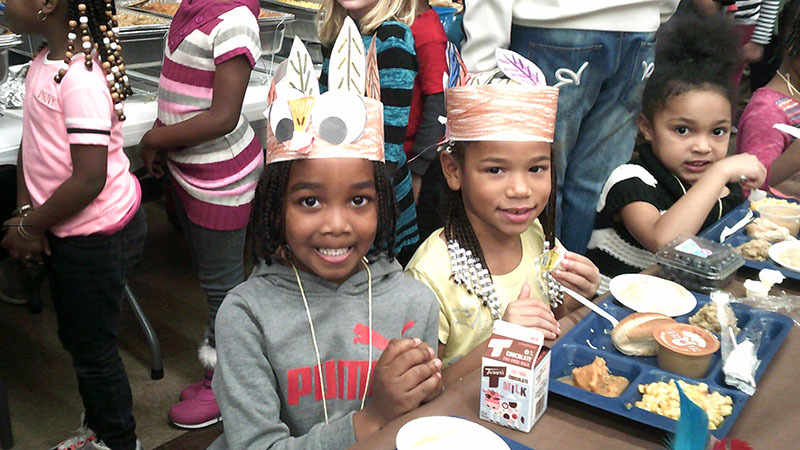 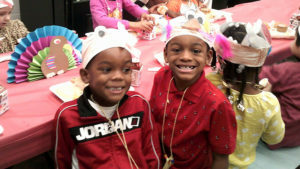 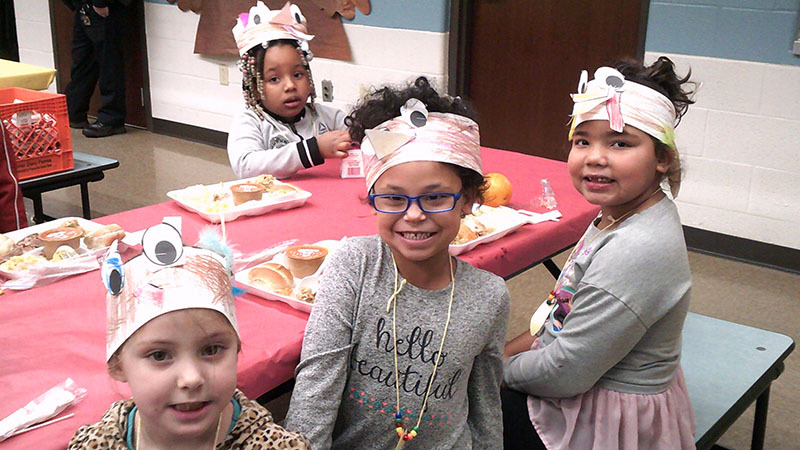 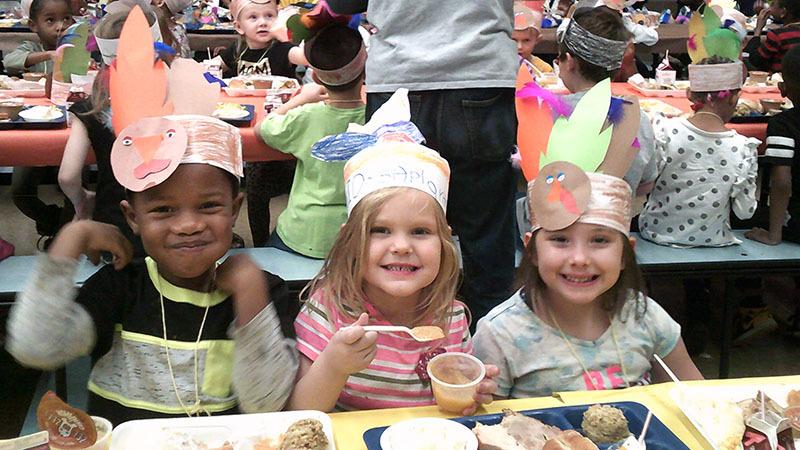 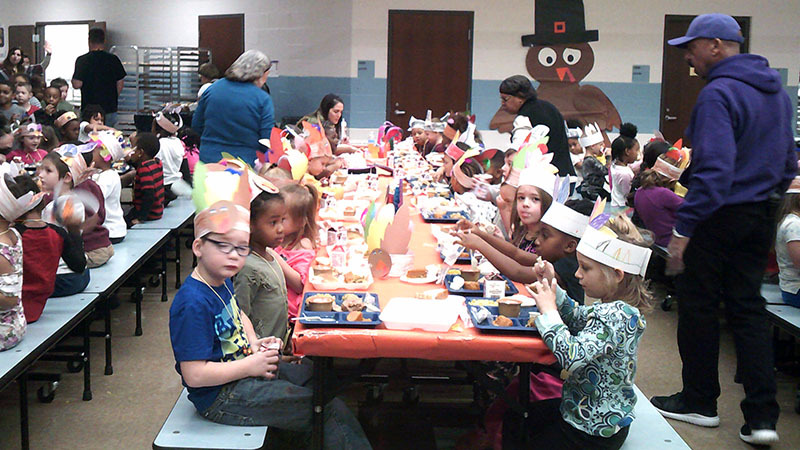 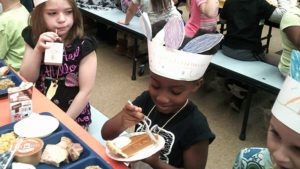 Students show off their Thanksgiving hats while enjoying the lunch. 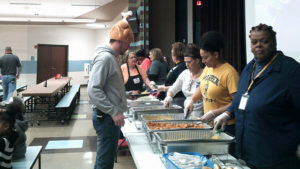 Pastor Todd volunteers his time to help with lunch. 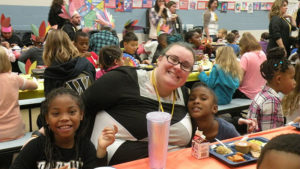 Mrs. G sits with some students for the Thanksgiving lunch. Mrs. Rhodes smiles with one of her students. 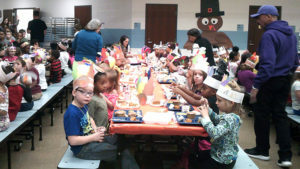 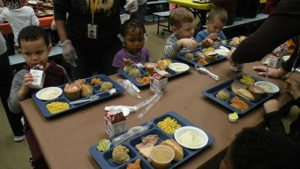 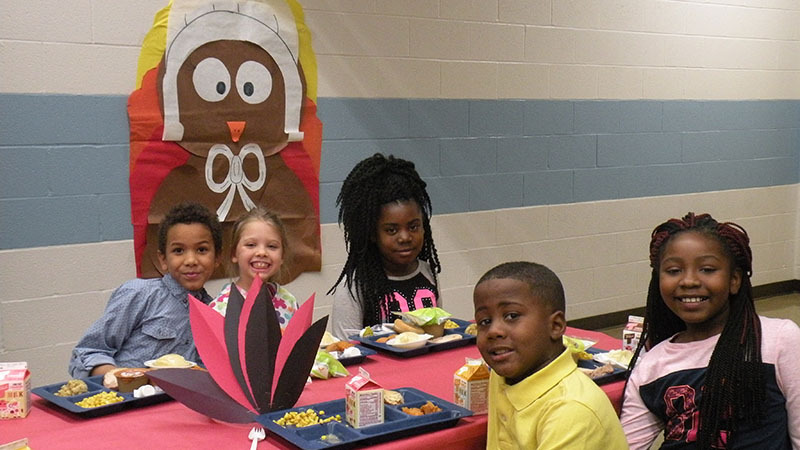 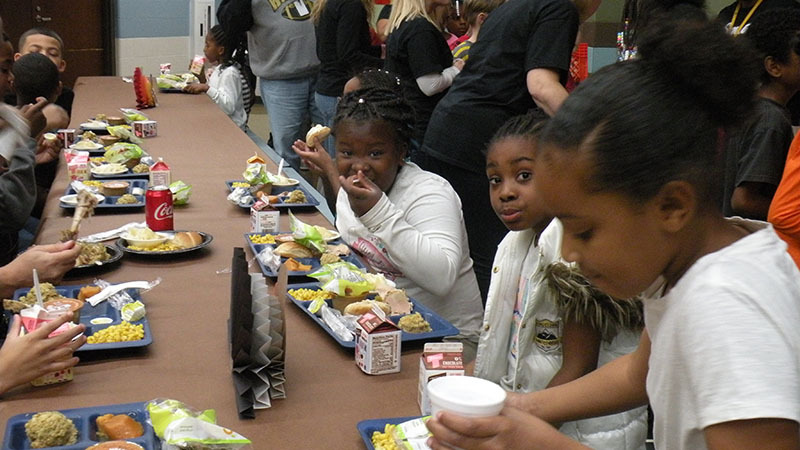 Students enjoy a full Thanksgiving meal. 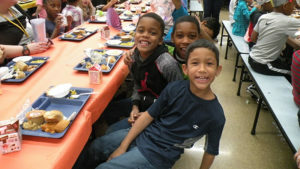 Students take a break from their lunch to smile for the camera. Third grade boys enjoying their Thanksgiving meal. 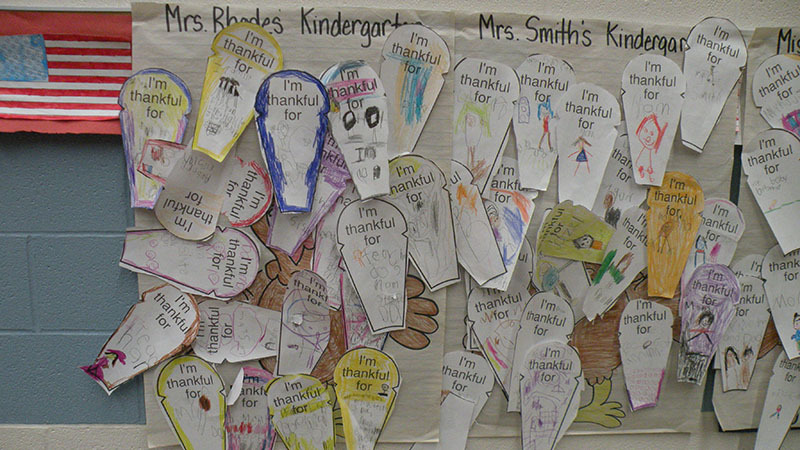 Kindergarten students write what they are thankful for. 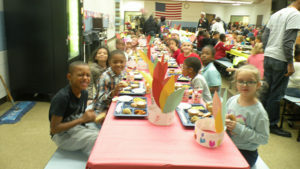 Students enjoying their Thanksgiving lunch. Mr. Seidel’s class enjoys lunch together. A student enjoys their pumpkin pie for dessert. Mr. Guthrie looks on as staff gets ready to serve the students. 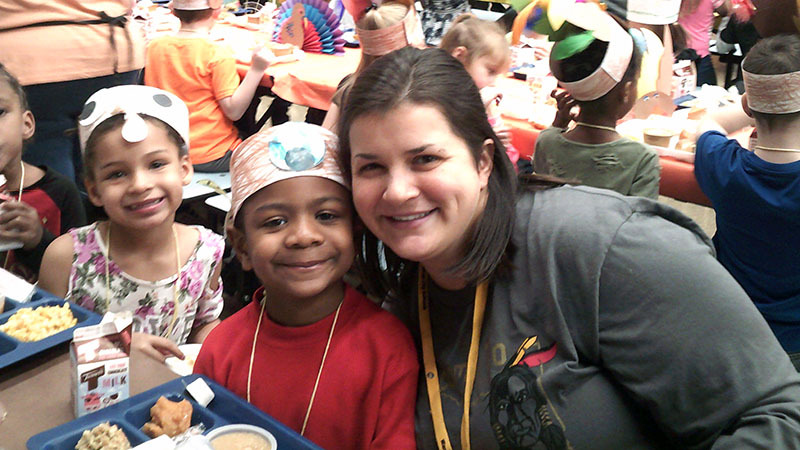 Kindergarten teachers and students enjoy Thanksgiving lunch together. A classroom enjoys lunch together. Kindergarten friends take a break from the lunch to smile for the camera. 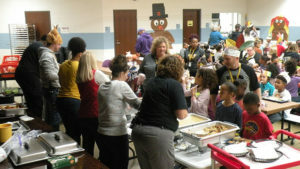 Staff serves the students their special lunch. 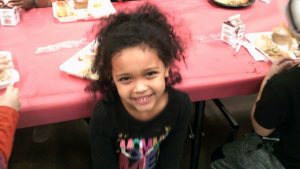 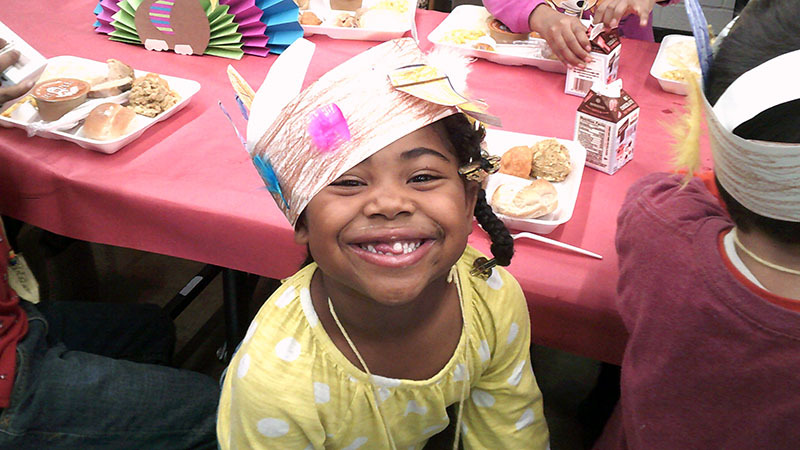 A kindergarten student smiles for the camera after her lunch. 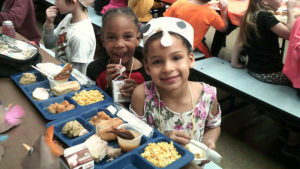 Kindergarten students enjoy their lunch together. 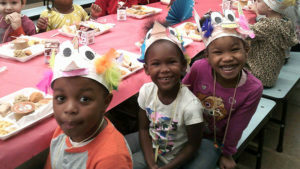 Kindergarten students smile for the camera. 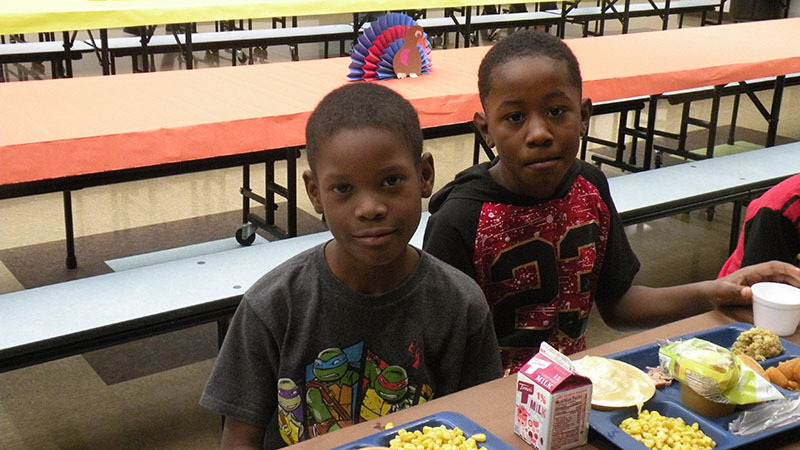 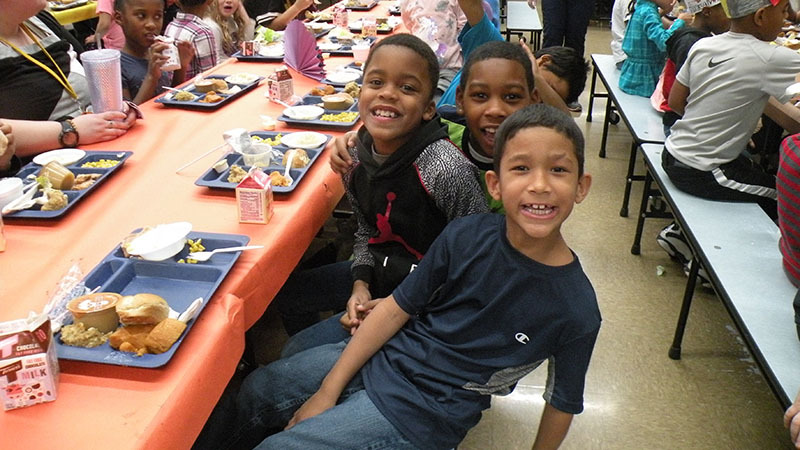 Second grade boys take a break from their meal to smile for the camera. 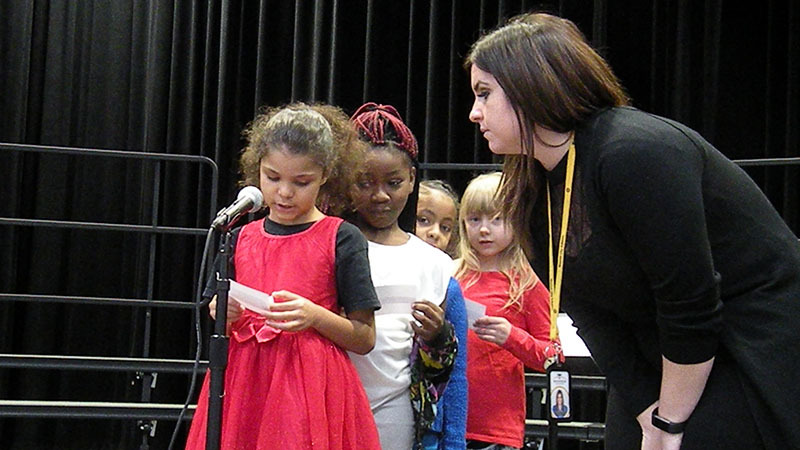 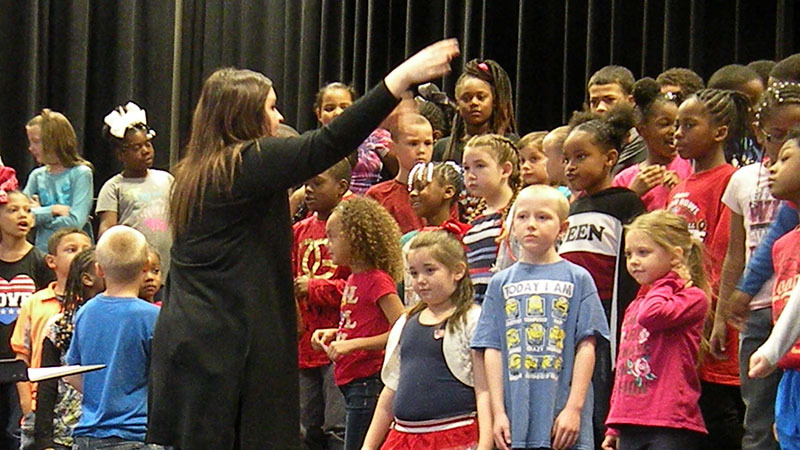 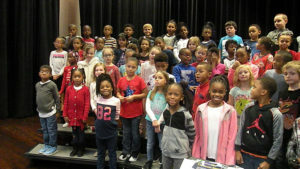 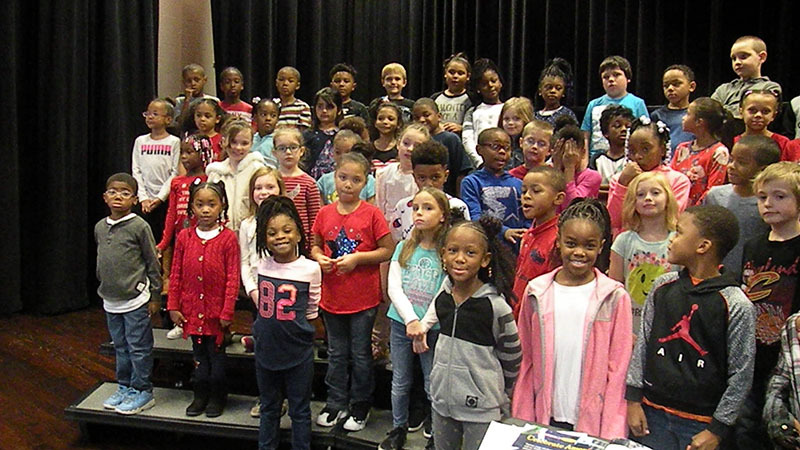 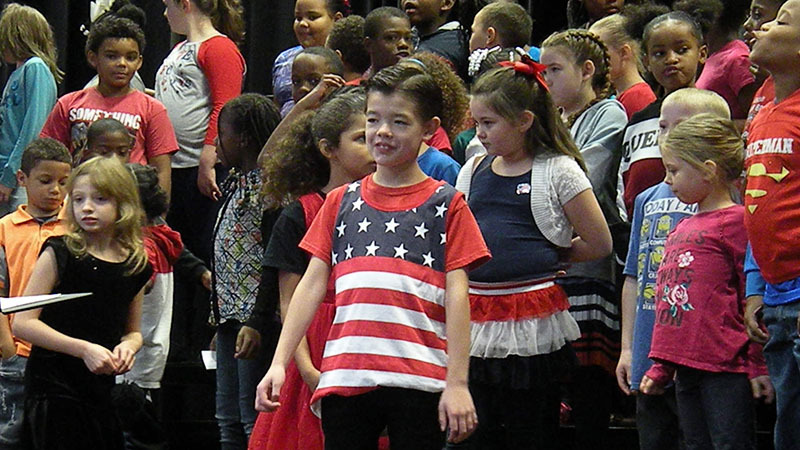 Students in grades 2 and 3 honored Veterans with a music performance on Friday, November 9th led by Miss Komsa. Students opened the concert by reciting the pledge of allegiance and listening to one of our 8th grade students perform the National Anthem. 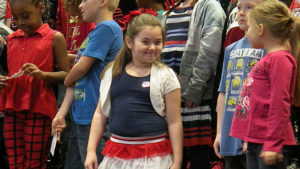 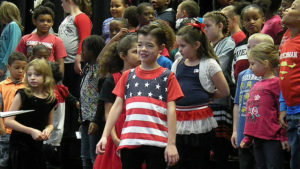 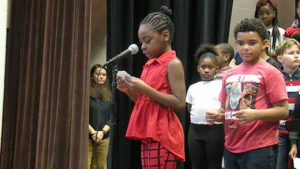 They then performed various patriotic favorites and recited poems. 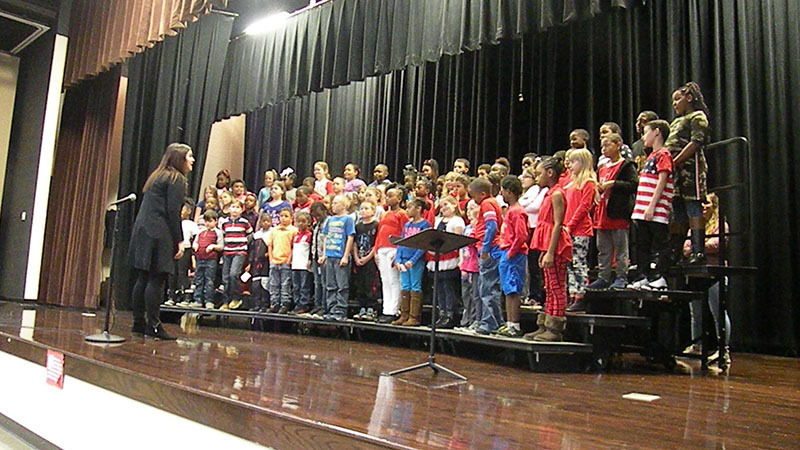 Thank you to Miss Komsa for preparing the concert and to all the students for their hard work in preparing for the performance. 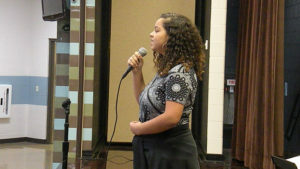 An eighth grader opens the concert with an acapella performance of the National Anthem. Miss Komsa gives the students final instructions prior to the concert. A student practices her poem for the concert. 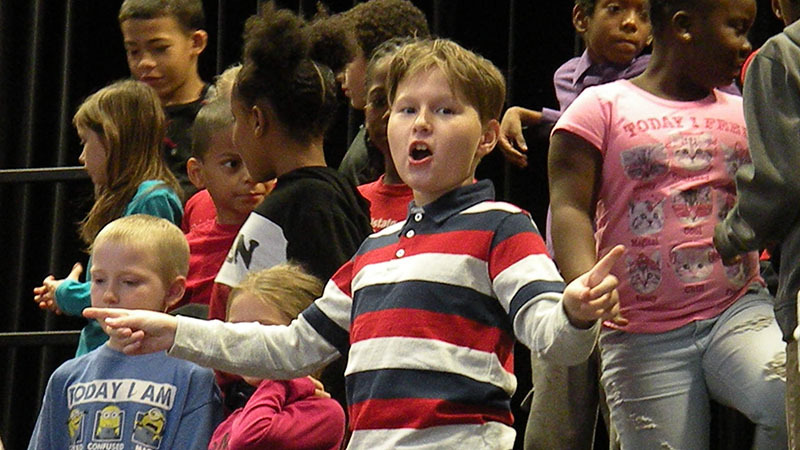 A third grade student stands and waits for the concert to begin. 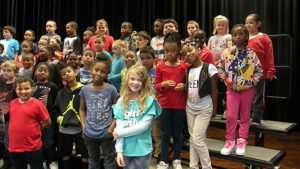 Students pose for a photo before the concert. 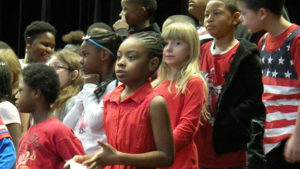 A student waits for the song to begin. 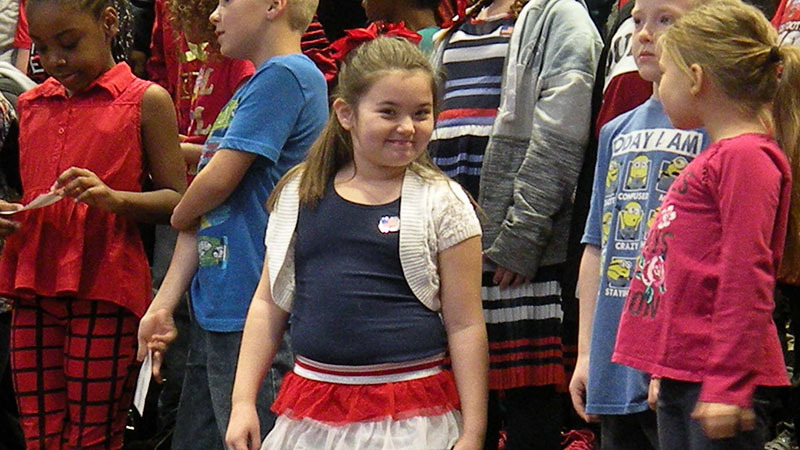 A third grade student smiles for the camera before the concert begins. 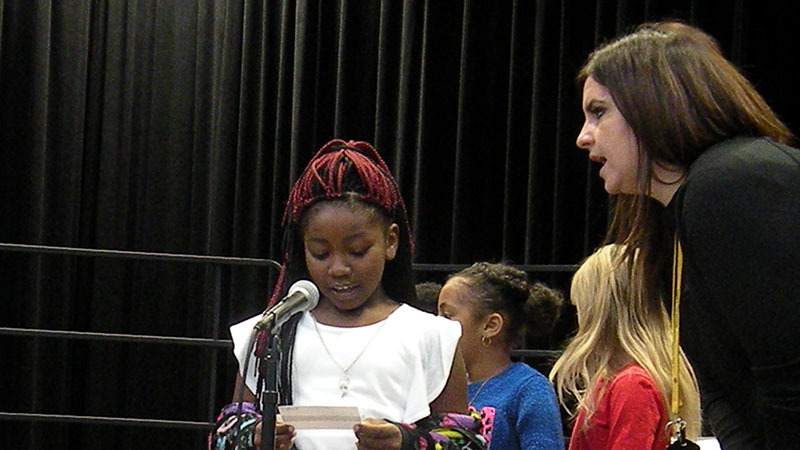 A third grade student practices the words to one of their songs. 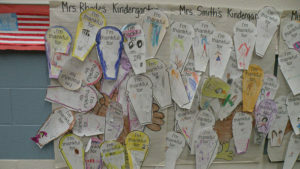 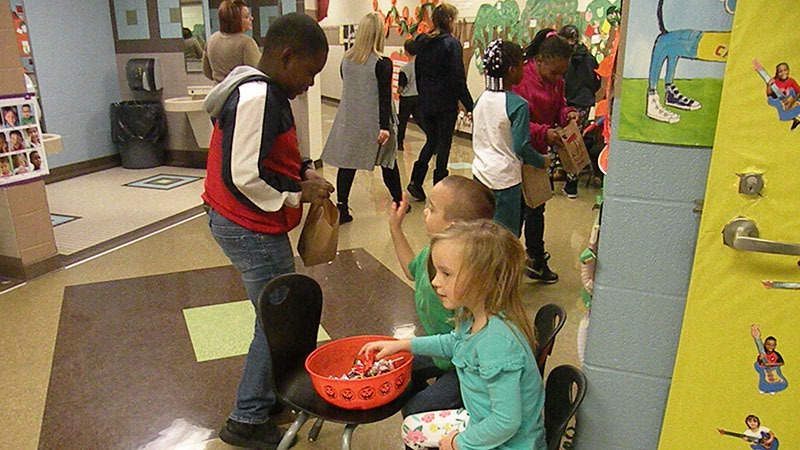 Students in grades K-5 celebrated the end of October with a candy walk. 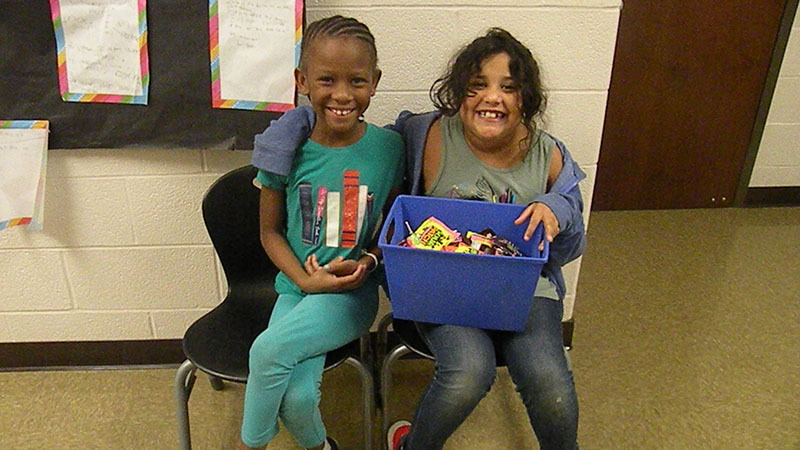 Students were able to visit classrooms and collect candy as a reward for their hard work and great behavior for the month. 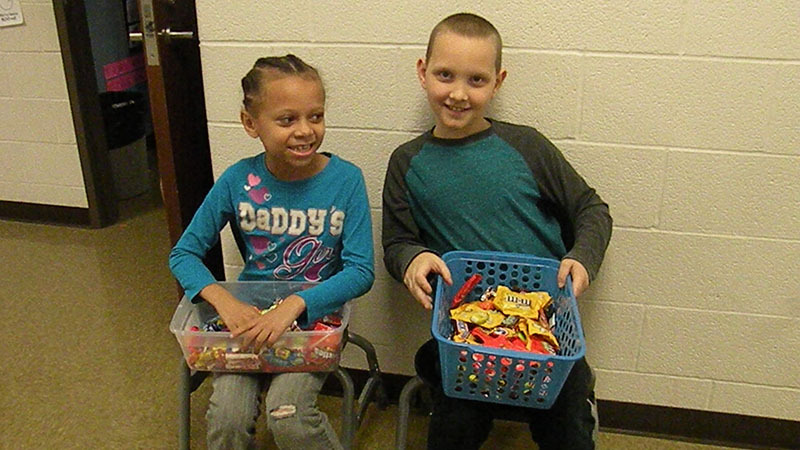 Thank you to all the staff that donated candy for the students. 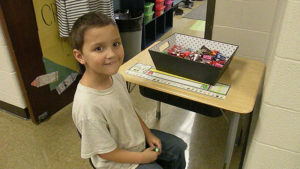 A student gets his candy from one of the classrooms. 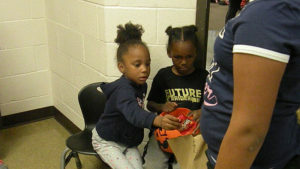 Students wait for the candy walk to begin. Student helpers waiting for classrooms to walk by. Students walk down the first grade hallway to collect their candy. 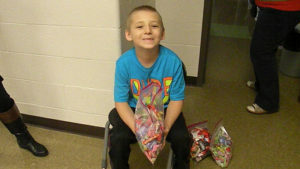 A first grade student passes out candy for the candy walk. Kindergarten students pass out candy. 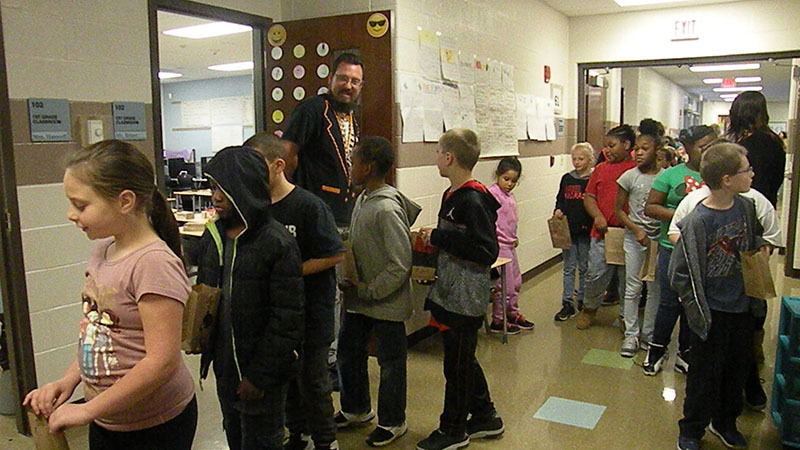 Mr. Bitner greets students as they walk past his classroom for the candy walk. 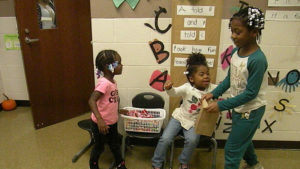 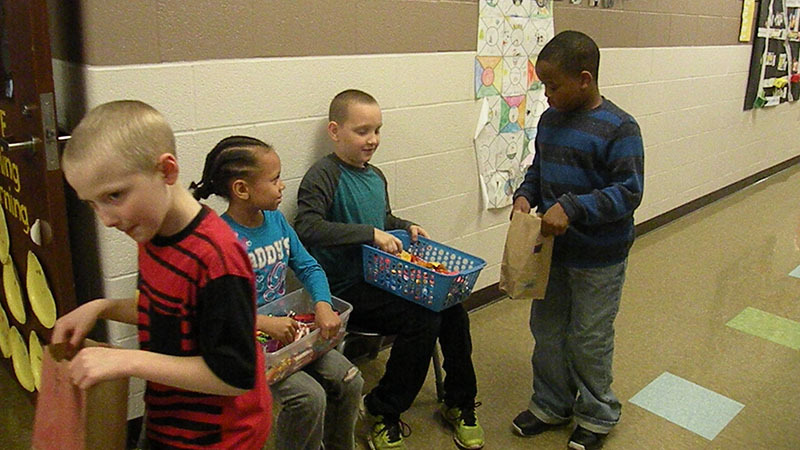 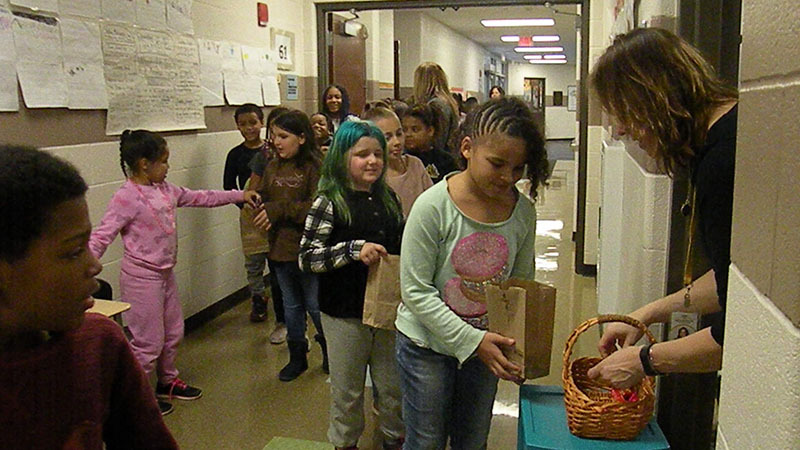 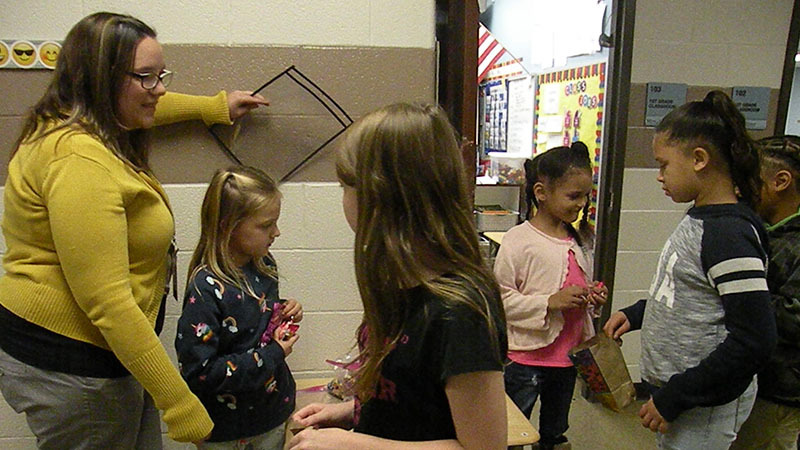 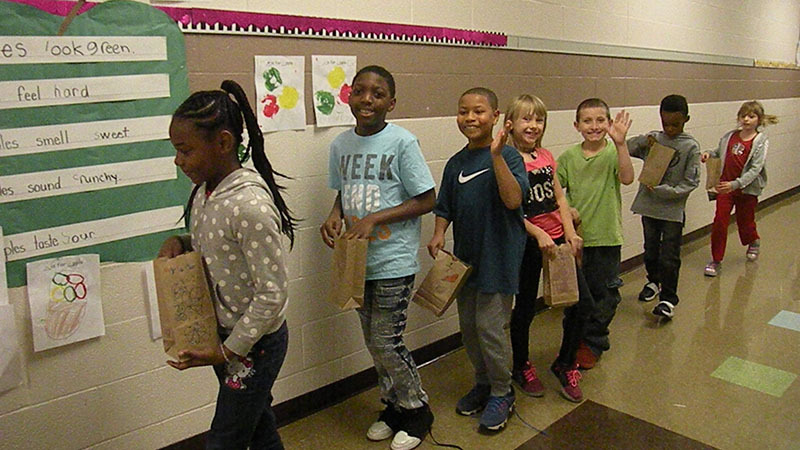 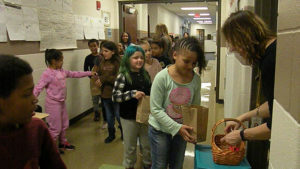 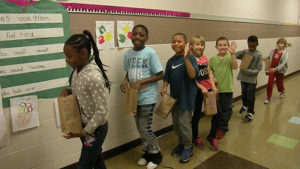 Students pass out candy outside of their classroom. Students collect candy as they walk past a kindergarten class. 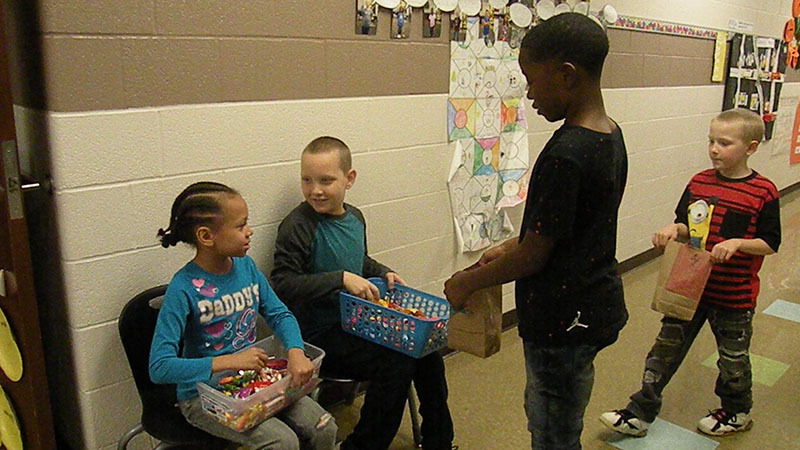 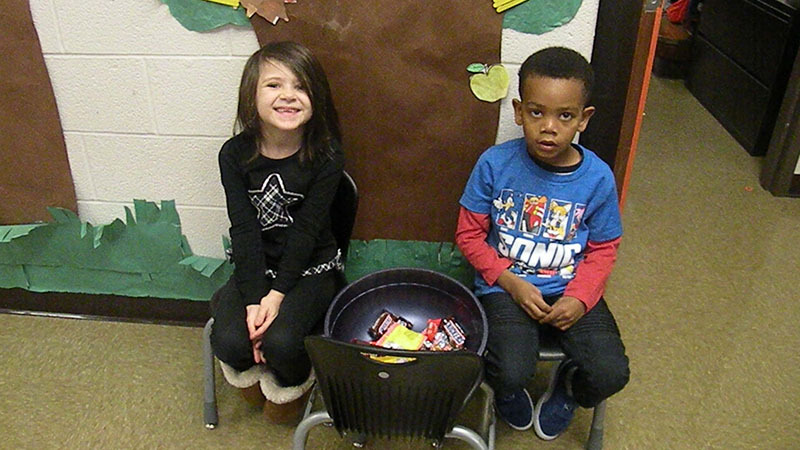 A student gets his candy from one of the classroom helpers. A student helper passes out candy. 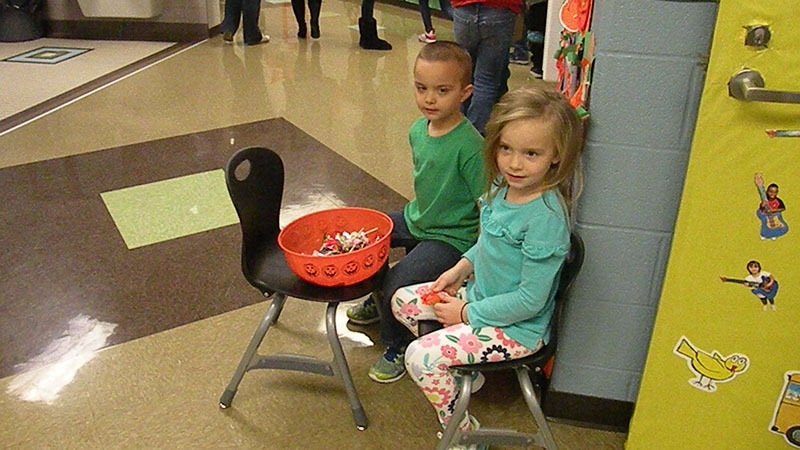 Kindergarten students wait to pass out candy. 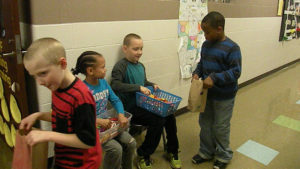 A student waits for his candy from the classroom helpers. 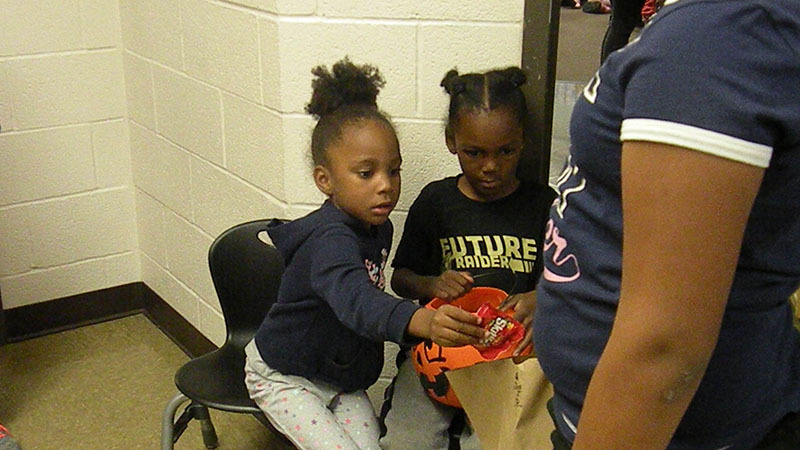 Helpers pass out candy in front of their classroom. 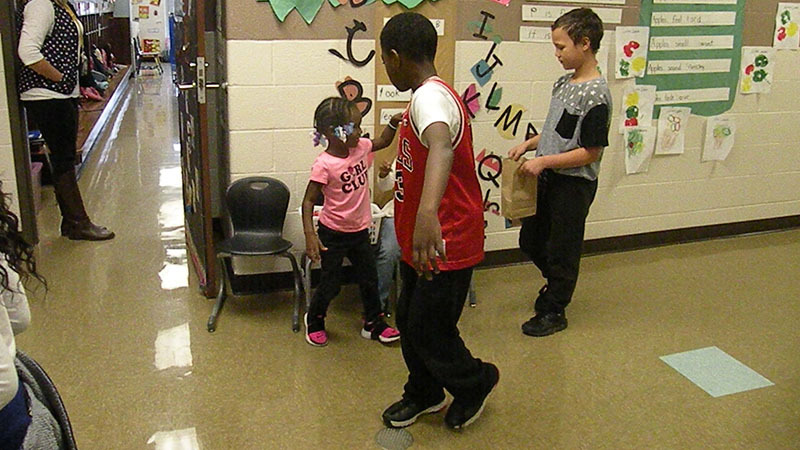 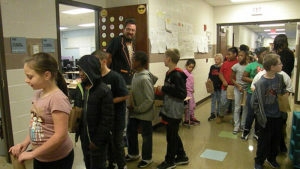 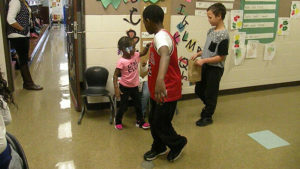 Students line up and wait to collect candy from the next classroom. 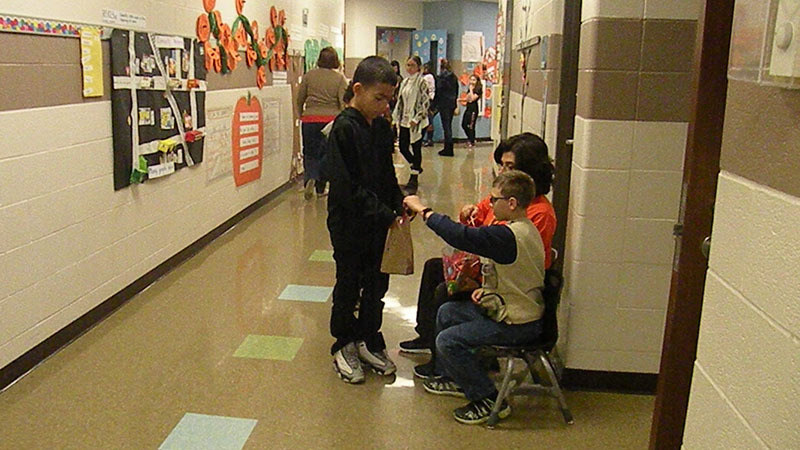 Mrs. Goodyear passes out candy to students as they pass her office. 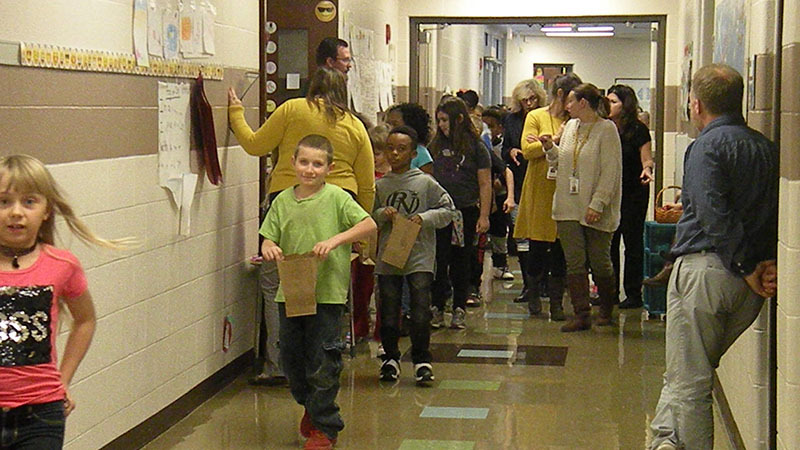 Students and teachers line the halls ready for the candy walk to begin.